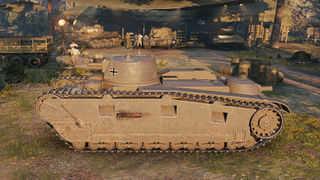 The Großtraktor - Krupp is a German tier 3 premium medium tank. 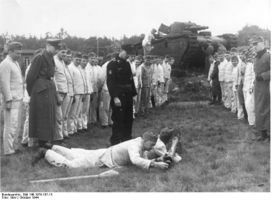 Thinly armored, very large and armed with a short barreled 75mm mini-howitzer, the "G-Traktor" is one oddball of a tank that plays very different compared to other tier III Mediums. To start, its (ahem) "armor" is pathetically thin, being nearly identical in thickness to the Vickers Medium Mk. III and stands a snowballs chance in hell of bouncing a shot from anything, so like the Medium III, play as a supporter, hiding behind your more armored peers and unleashing your high alpha damage shells on unsuspecting victims! 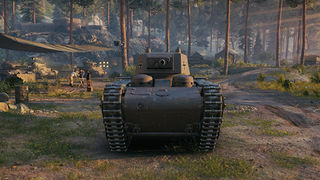 In terms of offense, this tank bounces back from its awful defense(at least against tier IIIs anyway), the 75mm gun can easily pick apart most tier IIIs from mid to close range, however, with bad accuracy and slow shell travel speed, sniping is a big no-no. One massive problem the G-Traktor faces however is its near uselessness against tier IV and V tanks, almost anything beyond tier III will laugh as your shells bounce off their armor and they make quick work of your large, underarmored tank. Dont be discouraged though, pack a few HEAT Shells and wait for your higher tier team mates to catch the enemy off-guard and go for their weakpoints; do this and you'll still be of some use, even in higher tier matches. All in all, play the G-Traktor cautiously, supporting your team from behind more heavily armored peers, lashing out at tier IIIs and going for the weakspots of tier IV and Vs when the time is right, stick to this method and you'll unlock this weird tank's true potential and discover how much fun it really is. - Highest HP pool of any Tier 3 (320), 10 more than the M3 Lee! 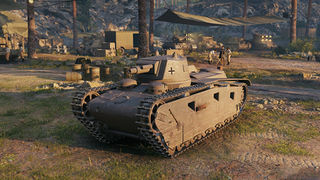 The Großtraktor is a tank that is more than capable of dealing massive damage to smaller tanks while not being entirely capable of withstanding damage in return. The Gtraktor's Kw.K 37 75mm howitzer has very high single-shot alpha damage, a characteristic which is amplified by using the gun's powerful HE rounds (which are almost equally as good at penetrating armor as the AP rounds). At close range, the Gtraktor can devastate poorly armored tanks and soak up shots from smaller guns with its large hitpoint pool. Also, despite being one of the largest tier IIIs, the Gtraktor is fairly maneuverable. With its good speed and very good gun depression value, the Gtraktor can flank and take advantage of terrain to conceal its great bulk. While the Gtraktor dominates against smaller or more poorly armored tanks of its tier, its effectiveness falls off greatly against higher tier enemies. The howitzer's poor penetration ability means the Gtraktor is almost completely ineffective against well armored tanks such as the Matilda and AMX 40. The gun's bad accuracy, poor handling characteristics, and low shell velocity also eliminate sniping as a viable option in high-tier games. In addition, the Gtraktors large hitpoint pool is much less effective at soaking up shots from more powerful high-tier guns. In such games, the Gtraktor is reliant on its larger allies to engage well armored tanks enabling it to attack their weaker flanks. Grosstraktor ("large tractor") was the name given to six prototype medium tanks built (two each) by Rheinmetall, Krupp and Daimler, for the German Weimar Republic, in violation of the Treaty of Versailles. Constructed in secret they were tested in the Soviet Union. They were used for training and retired as monuments after the Nazi party came to power. This page was last modified on 8 June 2018, at 18:28. This page has been accessed 44,601 times.